Bruschetta and antipasti to start, followed by a wood-fired tomato and mozzarella pizza with a glass of fine Chianti. Add limoncello. Hungry yet? RiverWalk’s Italian Cuisine restaurant serves nightly in the dining room. Restaurant located in the grand new Riverwalk Resort in Lincoln NH serves delicious Italian cuisine. Adjacent to the front desk, in the main lobby of the resort, this resort restaurant/bar can accommodate up to 120 guests with more seats on the covered deck overlooking the pools. Our main bar with classic wood and marble features has 18 seats with the pizza bar offering another 8 seats. Our main dining is adorned with a pergola and booth seating in addition to another larger seating area able to accommodate multi-family reservations. One of the main features of La Vista is the wood fired pizza oven offering some very unique flatbread pizzas, appetizers and other accompaniments. We serve Italian & American cuisine for dinner nightly. Steaks, Shrimp Scampi, Fra Diavolo, Fettucine Alfredo, and Chicken Parmesan are just a few of the favorites, along with other chef-inspired appetizers and entrees are on the menu. In addition, La Vista’s wine menu will offer a nice variety of both Italian and American wine offerings. In addition to the Italian inspired menu, our culinary team bakes fresh bread every day including our own flatbread pizza crust all while incorporating a focus on the freshest ingredients. Don’t forget about dessert, as that will also be made fresh in house to bring you the most delicious finale to your meal. At La Vista we are confident you will find our cuisine as some of the best in the White Mountains of New Hampshire! La Vista is open nightly for dinner service! “Please note, due to popularity, the restaurant can book up quickly especially during peak meal times. We strongly encourage guests to book their dinner reservation in advance prior to arrival. Please call 603-745-7555 to reserve. All reservations are based upon availability. RiverWalk Resort is excited to announce the addition of The Toast at La Vista, our new breakfast service! 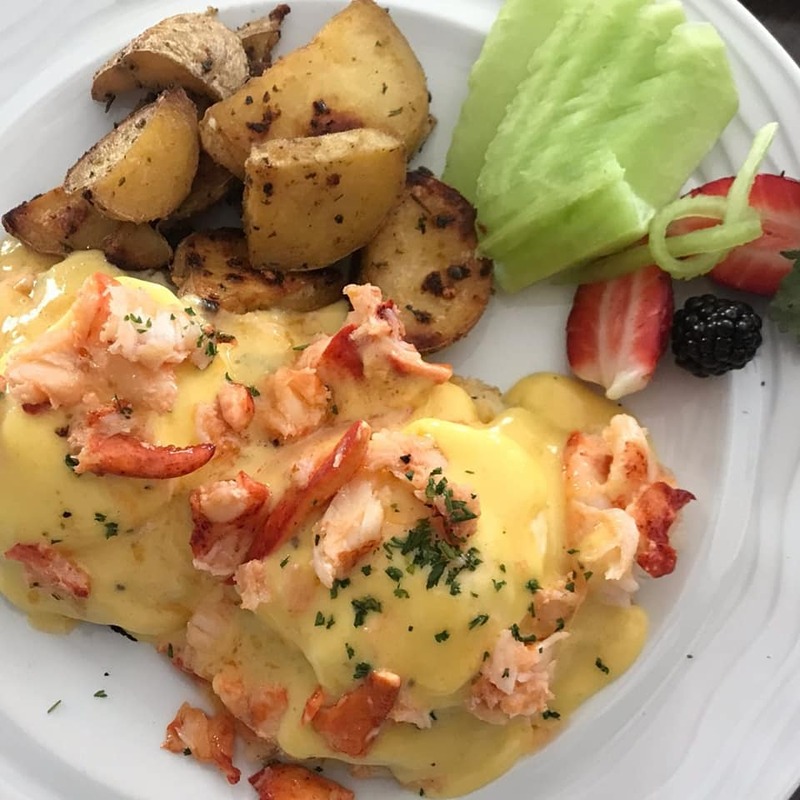 Serving up the classics and some more creative versions of breakfast like the Lobster Benedict (pictured left), Breakfast Burrito, Bananas Foster French Toast, Lemon Ricotta Pancakes, and more! Come and enjoy a delicious breakfast Monday to Friday 8-11:30AM (CLOSED Thursdays) and from 7-11:30AM on Saturday and Sunday. You don't have to be a guest to join us for breakfast! The Toast is open to the public and happy to serve fellow locals up with an awesome meal.